The theory of cosmological perturbations in an expanding universe is the main frame to describe the structure formation and to calculate the flactuations measured in the Cosmic Microwave Background radiation (CMB). Even though at large scale the universe appears essentially homogeneous and isotropic, nevertheless at some extent small perturbations had to be present in the primordial universe in order to allow the formation of galaxies, and clusters that we observe at present. The idea is that small primordial perturbations have grown up due to the expansion till to reach the scales of cosmological/astrophysical structures. The theory of cosmological pertubations studies the evolution of such primordial disomogeneities. The gravitational instability is a natural property of gravitation, and the presence of small regions of overdensities yields an attractive force on the matter placed around, which collapsing on the overdensities enhances the process. Nevertheless, such positive feedback, that in a static universe would cause an exponential instability, is partially counterbalanced by the universe expansion. This results in a power law growth of perturbations. From a mathematical point of view, one must solve Einstein’s equations in a framework of an expanding universe, taking into account at the same time the freedom to choose a generic reference frame (gauge choice). Such freedom is responsible for the appearence of fictitious perturbations, which do not describe any real disomogeneity, but rather the properties of the reference frame chosen. Note that the perturbation has no physical meaning but is only due to the choice of reference frame. In an analogous way one can eliminate real perturbations through the choice of particular frames. Since physical quantities have to be gauge independent, it has been developed a gauge-invariant formalism which will be briefly reviewed in the following. Let us assume that the space-time is in first approximation homogeneous and isotropic and the deviation from this behaviour is small enough to treat it as a perturbation. In this case it is convenient to split the metric in two contributions: an homogeneous and isotropic one describing the background, and an additional term representing the perturbation. where the symbol ‘ stands for d/dη . where the perturbations are encoded in the term . In the linear approximation different perturbations evolve independently and hence they can be studied separately. The perturbation of a metric can be of three kinds: scalar, vectorial and tensorial. The classification concerns the way in which the different fields involved in transform under the Lorentz group. Vectorial and tensorial perturbations do not show instability. The first ones decay in an expanding universe, whereas the tensorial lead to gravitational waves that do not couple to disomogeneity in the energy density and pressure. Scalar perturbations are more interesting since they can have a role in the growing of disomogeneity and thus affect the dynamics of matter. 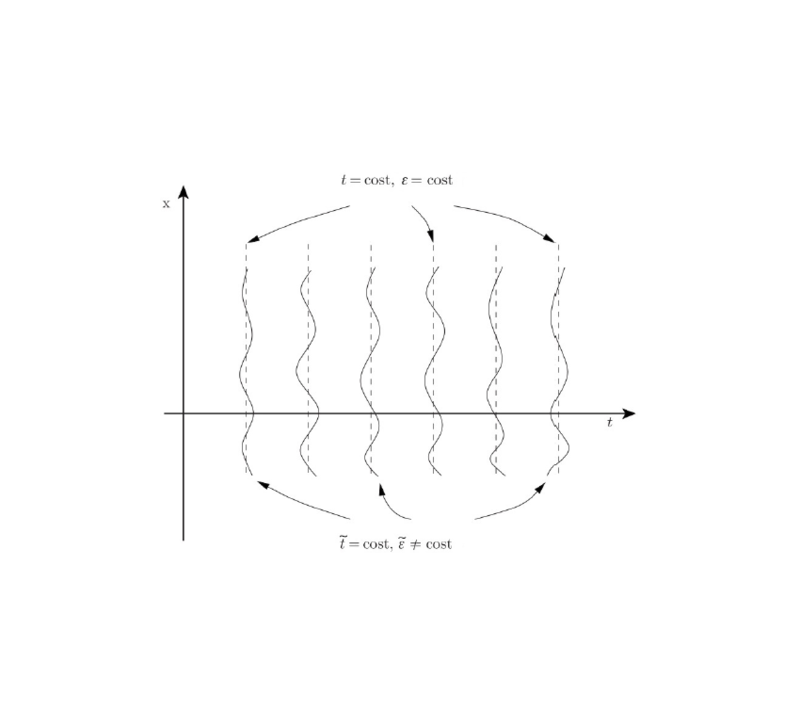 2) deriving two times a scalar field by means of the covariant derivative. Two additional scalar fields are then necessary to fully characterize δgμν . One is required for δg00, whereas δg0i can be derived in terms of the spatial derivative of a second scalar field, respectively. where is a vector divergenceless and a scalar function. From which it is possible to obtain the transformation law for each kind of perturbation. The variables Φ and Ψ have been introduced by Bardeen for the first time, they have an intuitive physical meaning and have simple EoM. The gauge freedom can be used to fix additional conditions on the function φ, ψ, B and E, this by choosing in a proper way and . Whenever the spatial part of energy-momentum tensor is diagonal we have or , hence it is sufficient a single variable to describe the perturbation of the metric, which in this case can be regarded as a generalization of Newton gravitational potential. This is at the basis of the alternative name given to the longitudinal gauge, i.e. conformal newtonian gauge. Observing the form of the metric, the gauge-invariant variables have a clear physical meaning they represent the amplitude of metric perturbations in the conformal newtonian gauge. is gauge-invariant, hence only two of the four independent Si and Fi characterize the physical perturbation. and hij is invariant for coordinate transformation. Such field describes in a gauge-invariant way the gravitational waves. In particular the term can be rewritten as a function of the gaige-invariant variables Φ, Ψ. The Equations have been obtained without fixing any gauge condition and hold in any reference frame. In order to complete the set of equations it is necessary to know the EoM for the matter fields. where is a linear function of the perturbation of the scalar field and of the metric . where Φ is the potential gauge-invariant and is the gauge-invariant part of the scalar field perturbation. where the solutions can be easily found in the asymptotic limit by considering plane waves perturbations . where C1, C2 and A are integration constants. where “the dot” denotes the derivation with respect to physical time . where the expansions have been obtained by means of iterative integrations by parts. Note that the series result to be of asymptotic type. namely, when the wavelength of the perturbation crosses the Hubble radius. By using such formalism is not necessary to make any assumption on the duration of reheating, and on its particular mechanism, whenever perturbations leave the Hubble radius before reheating to reenter only at a later time. Moreover it is necessary to assume that the duration of reheating be negligible with respect to the inflationary epoch as well. 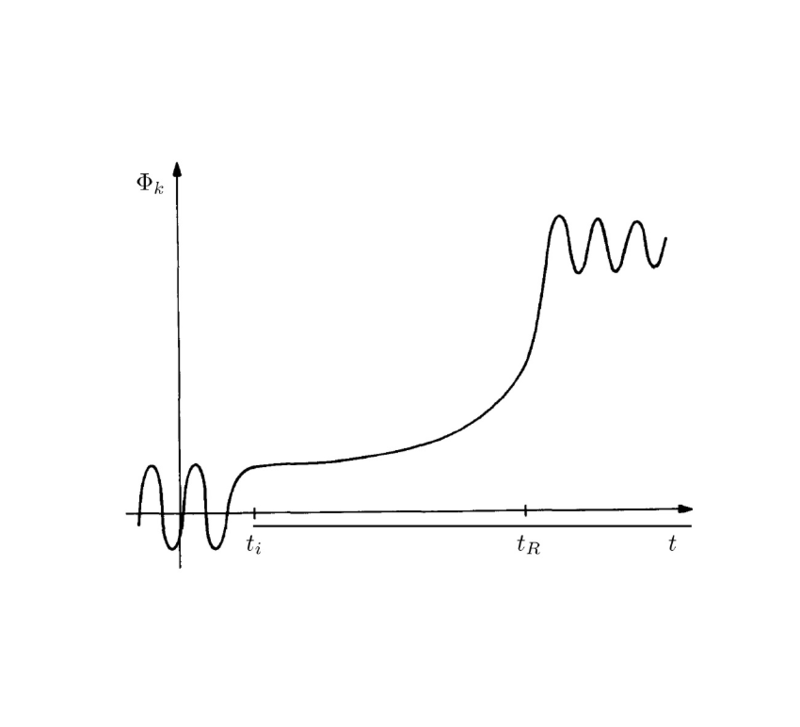 Evolution of the gauge-invariant gravitational potential for a plane wave with wave number k during the inflationary epoch. Note that t_R denotes the reheating time.